Google Award 2017: Project "PennCH3"
The 2017 Google Award for the best final project went to Hung Nguyen, Chirag Shah, Hitali Sheth, and Harsh Verma for their "PennCH3" search engine. PennCH3 not only searches the web but also displays information from a variety of sources, including soccer scores, stock quotes, weather forecasts, and shopping results. 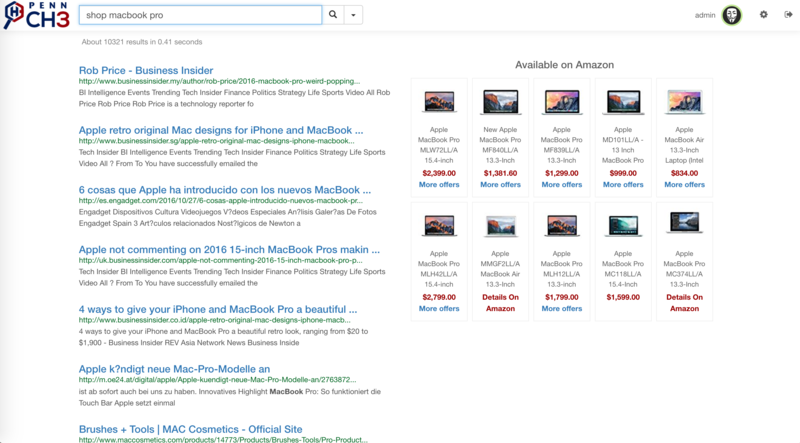 Users can also submit searches using their Alexa-enabled devices. Under the hood, the system is highly scalable and uses replication for fault tolerance; the team (boldly) proved this by killing some of the nodes during a live demonstration. Google generously donated four Google Home devices as a prize, and each member of the PennCH3 team received one of the devices. 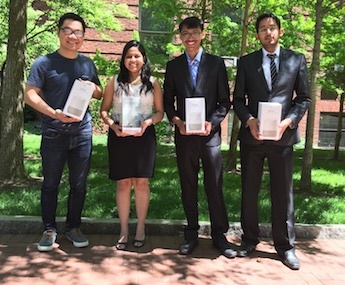 A honorable mention went to project "Q+A" (Mani Mahesh, Archith Shivanagere, Rishisingh Solanki, and Sanidhya Tiwari), whose solution featured location-specific results and used reinforcement learning to improve the results based on feedback from the users. 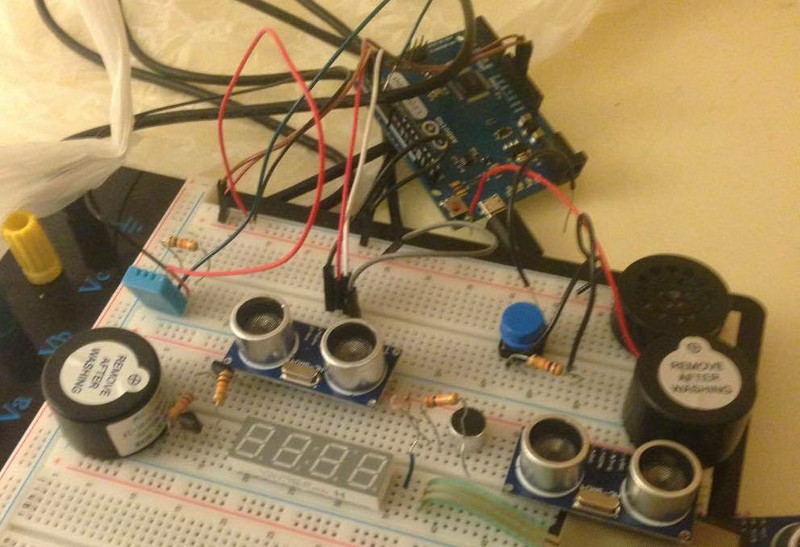 Google Award 2016: Project "AhaeStack"
In 2016, the Google Award for the best final project went to Matthew Howard, JJ Lee, Spiro Metaxas, and Chad Nachiappan. 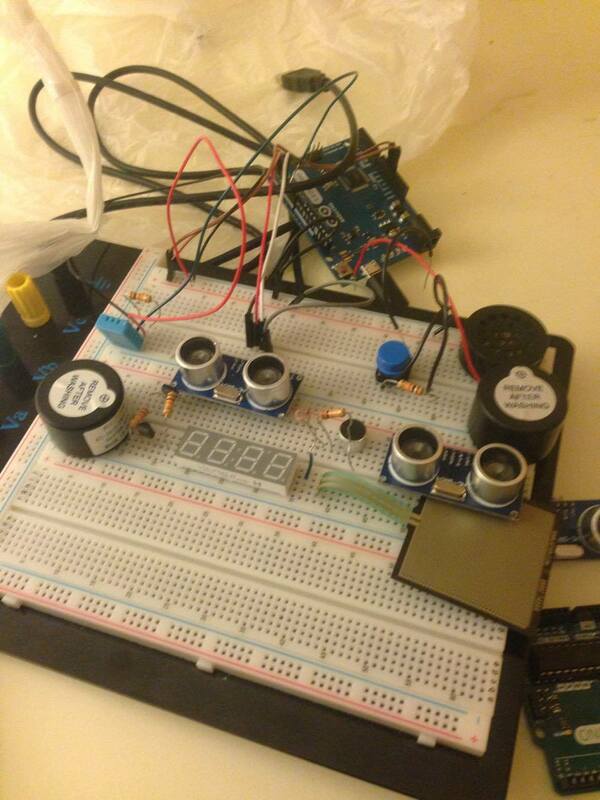 Matthew, JJ, Spiro, and Chad built a scalable, cloud-based search engine called "AhaeStack", which included widgets for sports scores and shopping results, a weather forecast, and a stock ticker, as well as a special hardware device (shown above) that can be used to control the engine with hand gestures. 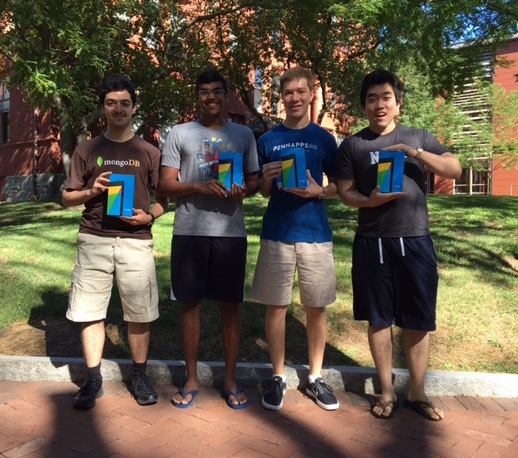 Google donated four Nexus tablets as a prize for the best project, and each member of the AhaeStack team received one of the tablets. A honorable mention went to team "Sensei+3" (Anupam Alur, Harshal Lehri, Rishab Gupta, and Vidur S. Bhatnagar), whose solution had an impressive modular design and featured, among other things, a full eBay integration. Google Award 2014: Project "AVERNUS"
In 2014, the Google Award for the best final project went to Chenyang Yu, Xuan Zheng, Sitong Zhou, and Yang Wu. Chenyang, Xuan, Sitong, and Yang built a scalable, cloud-based search engine called "AVERNUS", which consists of a scalable, distributed crawler, an indexer, a PageRank engine, and a web frontend. 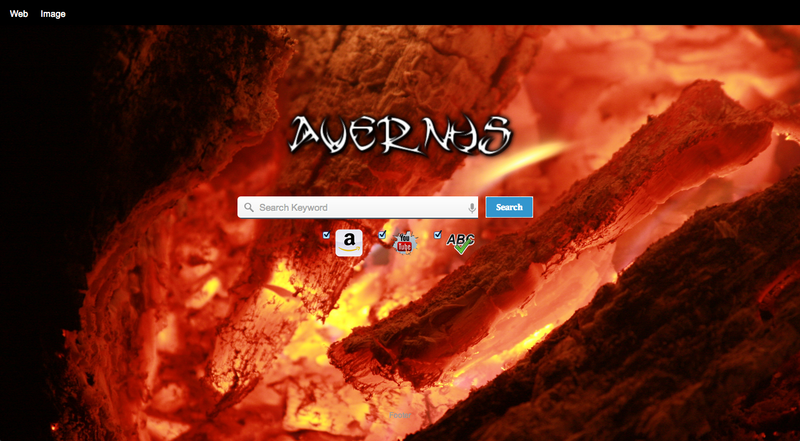 AVERNUS also has a number of advanced features, such as image search, and it is partly based on a new MapReduce framework that was implemented from scratch by the authors. 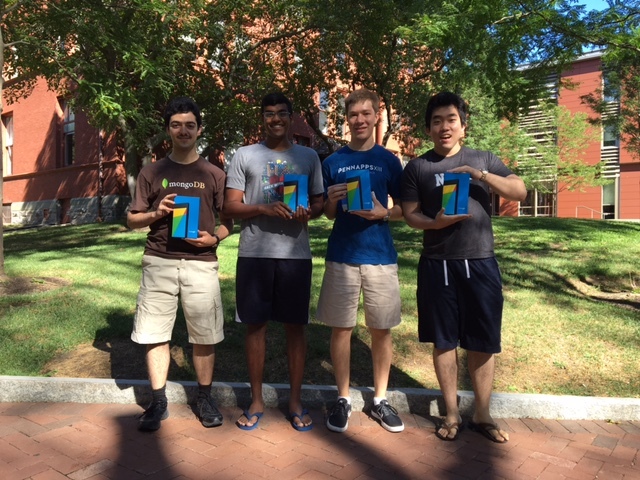 Google donated four Nexus 7 tablets as a prize for the best project, and each member of the AVERNUS team received one of the tablets. Honorable mentions went to Team "YASE" (Chaoyi Huang, Xinchao Shen, Huinan Yu, Mengli Li), whose search engine offers a number of extra services - such as weather forecasts and shopping results - and to Team "Googol" (Adam Colombo, Alyssa Battistuz, Joshua Stone, Sean Welleck), whose solution uses geolocation to improve the relevance of its results. Google Award 2013: Project "70!" 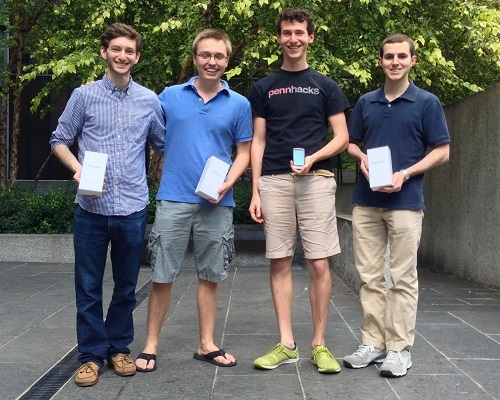 The 2013 Google Award for the best final project went to Brandon Krieger, Steven Krouse, Mitchell Stern, and Edward Wadsworth. Brandon, Steven, Mitchell, and Edward built "70! 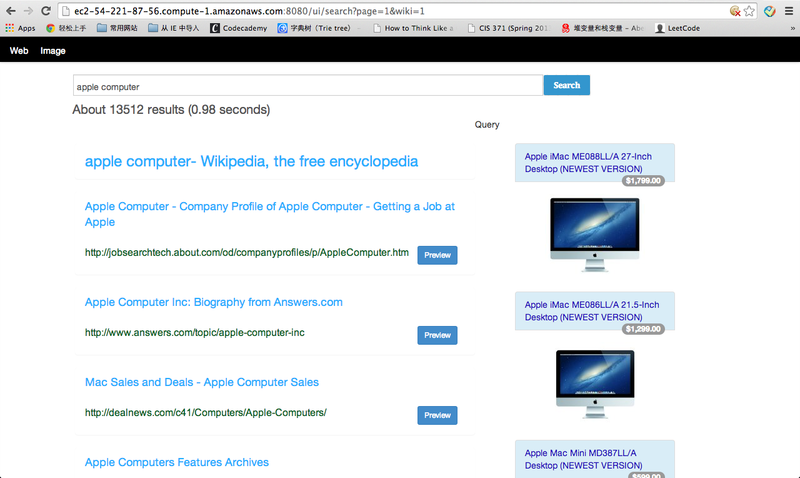 ", a cloud-based search engine. 70! consists of 1) a scalable distributed crawler that runs on Amazon EC2 instances and uses FreePastry for coordination; 2) an indexer and a PageRank engine that is based on Elastic MapReduce; and 3) a web frontend. 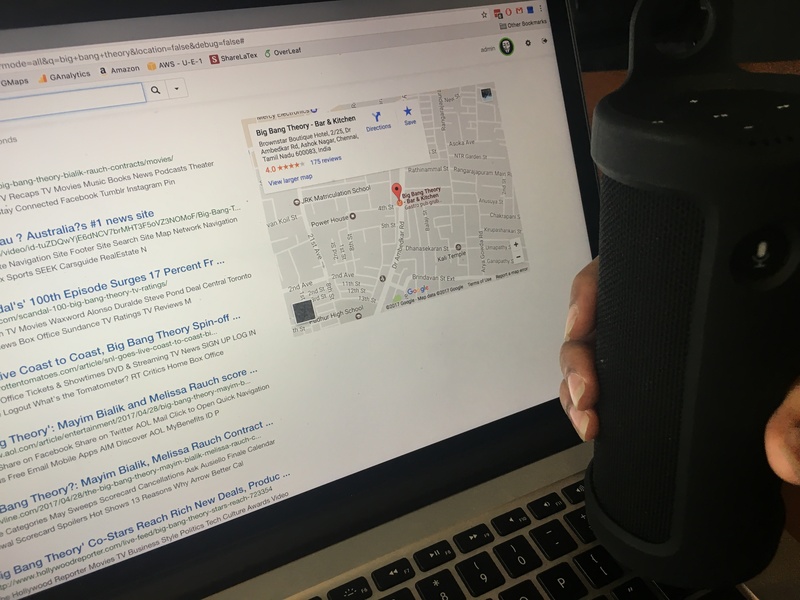 Hitchhiker can show previews of the results it returns, and it supports voice-controlled search; as a special feature, users can navigate the results by 'swiping' with their hands in front of a webcam. 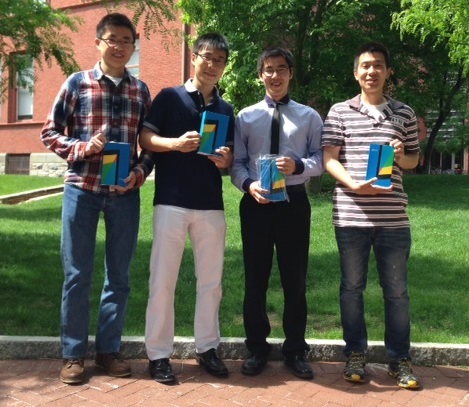 Google donated four Nexus cell phones as a prize for the best project, and each member of the 70! team received one of the phones. Honorable mentions went to Team "Ozone" (Swati Goswami, Gokulkrishnan Ragunathan, Sriram Ramanujam, Harini Srinivasan), whose search engine had an impressive "staged" architecture and a stunning front-end design, and to Team "8ball" (Amit Bose, Vikrant Goel, David Gregson, Hari Rajaraman), whose solution supported image search via a separate crawler and offered lightning-fast results. Google Award 2012: Project "Hitchhiker"
Hitchhiker's homepage Results for "Apple"
The 2012 Google Award for the best final project went to Dhruv Arya, Santhosh Kumar Balakrishnan, Saurabh Garg, and Chetan Singh. 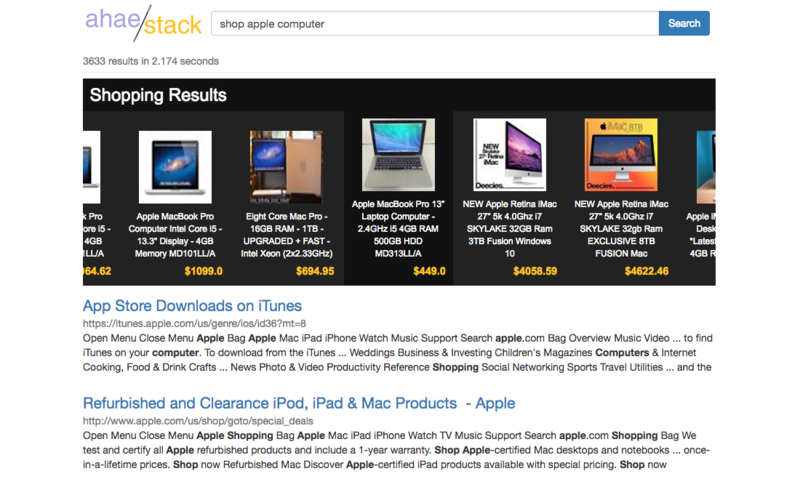 Dhruv, Shantosh, Saurabh, and Chetan built "Hitchhiker" a cloud-based search engine. Hitchhiker consists of 1) a scalable distributed crawler that runs on Amazon EC2 instances and uses FreePastry for coordination; 2) an indexer and a PageRank engine that is based on Elastic MapReduce; and 3) a web frontend. 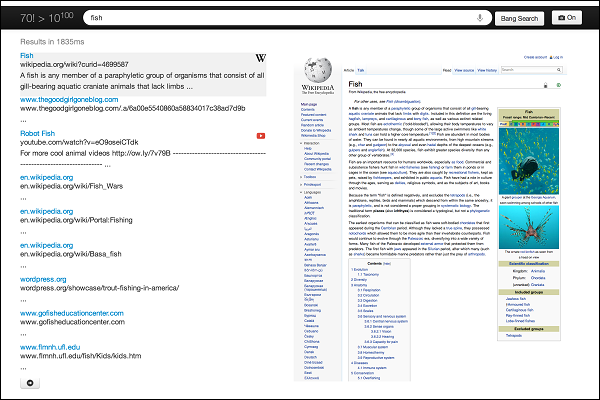 Hitchhiker also contains a number of extra features, including page previews, a "safe search" to filter out explicit results, and a special search for the visually challenged, which enables the user to control the search entirely with spoken commands. 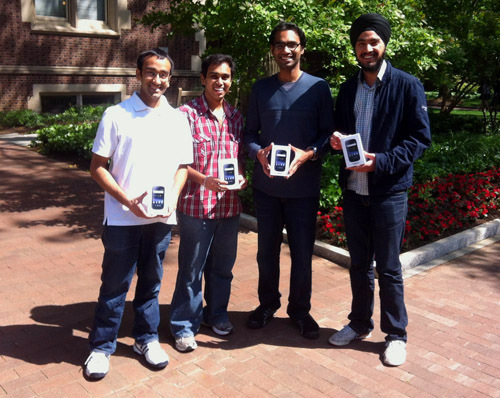 Google donated four Nexus cell phones as a prize for the best project, and each member of the Hitchhiker team received one of the phones. Honorable mentions went to Project "The Omniscient Search Engine" (Pratikkumar Patel, Yat Ming Ho, Tianming Zheng, Jiehua Zhu) and to Project "Splend" (Mengyao Chai, Ruogu Hu, Zhou Tan, Chen Yang).